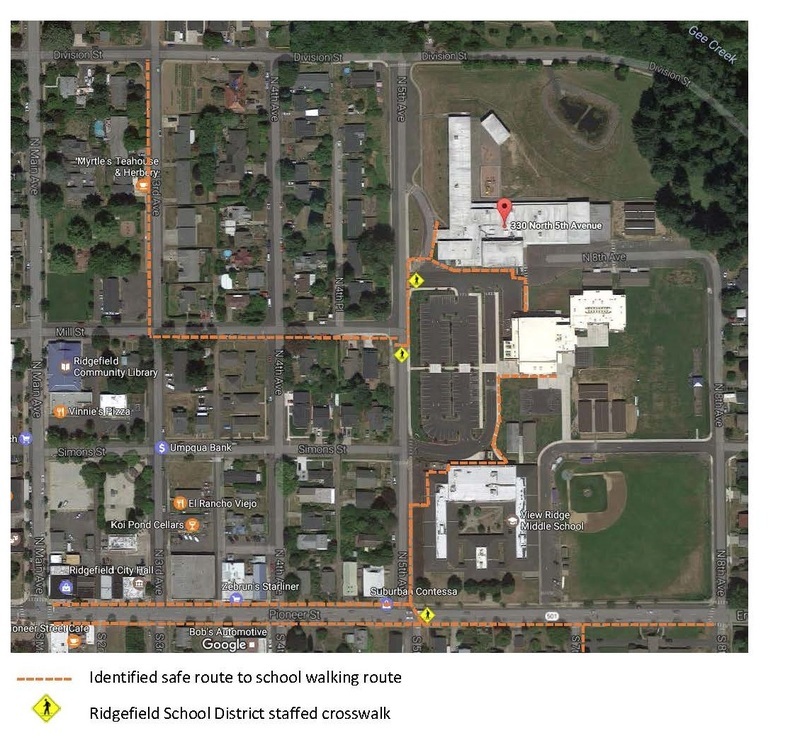 To ease increasing traffic congestion and to make streets in and around Union Ridge Elementary safer for students, the district has developed and approved a Safe Routes to School Plan for the immediate vicinity surrounding Union Ridge. A Safe Routes to School Committee comprised of representatives from Ridgefield School District, the City of Ridgefield, the Ridgefield Police Department and KWRL Transportation was established this year and tasked with the responsibility of determining safe walking and biking routes for students within a one-mile radius of the school. The committee looked into a number of factors. These included traffic patterns, existing traffic controls, existing school patrols, the number of school crossings, and number of entrance-exits from each block to/from school, to name a few. They also determined the safest routes based on distances between students and traffic along walking routes, traffic speeds, traffic volume and the number of road/rail crossings in the area. Their work resulted in a Safe Route to School Plan developed for Union Ridge, which was reviewed and approved by the district’s Safety Advisory Committee (SAC) and by Superintendent Nathan McCann. In conjunction with this safe route plan, the district is urging parents to change their driving route when picking up and dropping off their students. When leaving Union Ridge, parents are encouraged to turn right on N. 5th Avenue, turn left on Division Street and turn left on North Main Avenue to get back on Pioneer Street. This will greatly alleviate congestion in front of the school’s parking lot where Mill Street meets N. 5th Avenue and increase safety for students as they cross the street at this busy intersection.